"Romney campaign stands by Mourdock". Women.. For Goodness sake.. WAKE UP.. If ever there WAS a sign from God, this would be one of them.. These 'men' who are completely uneducated and ignorant about a woman's body, want to be in charge of the laws that Govern YOUR body. There is no other way to put it. Welcome to the year 1642 where science and medicine take a back seat. Don't even dare mention the earth revolves around the sun. The Governor has said if he wins the Presidency that he would sign legislation if presented, that bans abortion. And you have GOP senators and Congressmen who have now said that women who get raped have no medical worries as they can't get pregnant if they are 'really' raped, and now with Mourdoch, it is 'God's Gift'. Vote like YOUR life, your daughter's life and health depends on it.. It's not playtime anymore, they are playing for keeps and total control.Have no doubt, this is 'the big grab'. 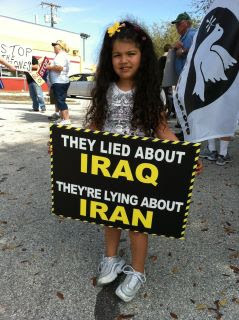 On Tuesday, President Obama will decide whether to add this little girl to the kill list. This article is very nice, I have found several things in this site. This is quite different and interesting. It becomes popular to the young generation day by day. Why hasn't Romney exposed Obama for his biggest lie, the promise to stop rendition, i.e., kidnapping, torture, and murder? Answer: Because he wants to do it also. When it comes to fundamental values, we have a "one party system". No challenges to this are allowed. Control of the lamestream media is easy when the rulers control the money, by way of fiat (paper) currency and legal tender law, i.e., compulsory participation in a rigged game. But knowing what is wrong is only the first step. Knowing how to correct the problems gov't creates is necessary also. We should start with attacking the root of our problem by abolishing it. Government does not protect, it destroys everything it touches. …what she [the moderator in the Ryan/Biden "debate"] was clearly asserting was that, in terms of the array of national security challenges America faces, Iran is the most important, at the top of the list. This idea is ludicrous; it's laughable. Iran has a minuscule military budget when compared to the United States. I read the piece in the dead tree edition of the WaPo this afternoon. Wow—what a tongue job! I'm not sure what you're trying to say, but I suspect you think this is a white-wash of the Iranian government.? 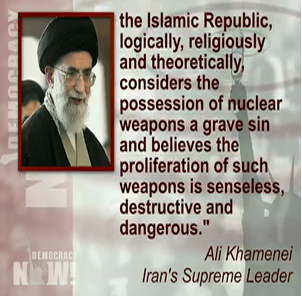 If "it" isn't building a nuclear bomb, for my purposes HERE, the government is only relevant in that if Iran is attacked, it isn't the government or its minions who will be damaged, it is the Iranian people. See, Vietnam, Iraq, Afghanistan, Serbia, etc. for examples. Why is it that people always shout "bias" when reasonable people (or in this case a large panel of experts) express opinions they disagree with? I feel badly for your students; their teacher is obviously narrow-minded. I appreciate the blogger for posting the most excellent thought. This topic posted by you is trustworthy. Fantastic blog site you’ve got listed here. It is tricky to find substantial good quality producing like yours currently. I truly enjoy persons such as you! Get care!! I continuously livelihood on upcoming to your parcel again retributory in best blog about basketball trainings always in serves information! Sending marketing sms to your client can make good effects on company promotion if you offer discounts and promotions on your products. The easiest campaign promise?? is the good article.Please let me know about the complete info,……thanks for this information.